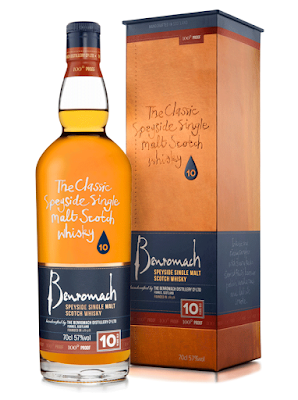 The 10-year-old Benromach wasn't the first product on the road to success by Gordon & Macphail. 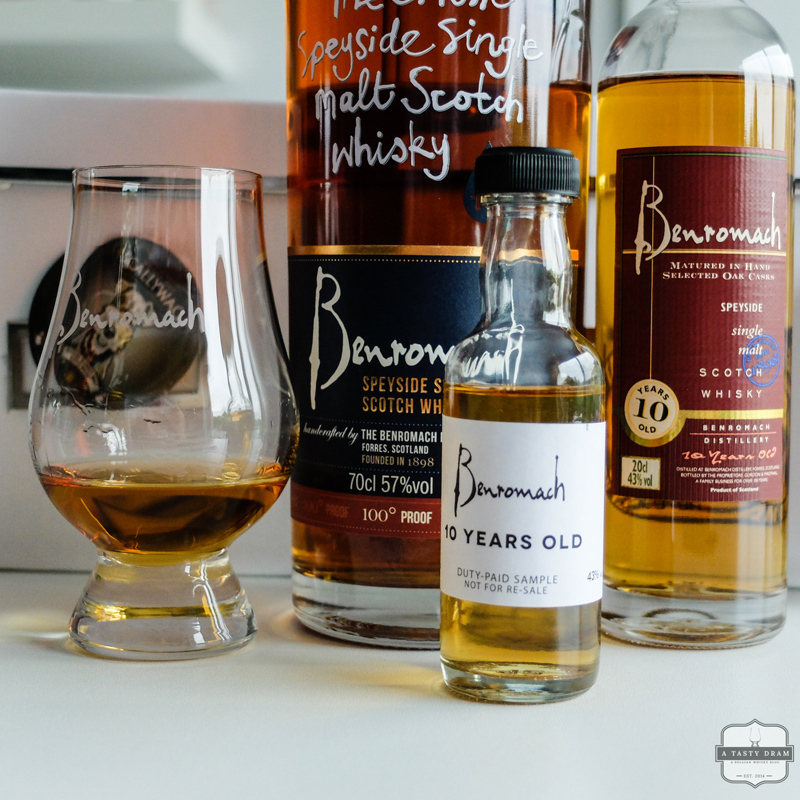 Previously they released a Benromach Traditional, a Benromach Organic and a Benromach Peat Smoke respectively in 2004, 2006 and 2007. It was only in 2009 (11 years after the official opening) that Gordon & Macphail could present the current cornerstone of the distillery's range. Colour: A classic whisky deserves a classic natural golden colour. The whisky leaves an oily coating on the glass. After a while, thin and fast legs start their race back to the bottom of the glass. Nose: Smoke wood chips and the faintest hint of peat. The smoke seems more pronounced than the previous edition. Popcorn drizzled with caramel and some salt. Raisins and dates. Golden syrup and sweet apples dusted with cinnamon. A second nosing revealed a fair dose of fresh peanuts. Water (2 drops, no more no less) lifts up the wood notes and gives plenty of red fruits. Red currants ready to be picked and blue grapes are also more prominent than last week. Caramel and vanilla giving a simple yet good base. And at last, there are some dried banana flakes. Taste: Sweet apples and juicy pears give it a sweet and creamy mouthfeel. Aromatic smoke wood and again red (and/or blue) fruit revealing itself. Sweet apple tobacco and grapefruit. Add some water and the blue grapes are all over the place. A distinct maltiness with a slightly bitter and nutty taste. A little bit of smoke lingers on the tongue. Dried fruits mix for that annual Christmas pudding. Finish: The creaminess really sticks on the tongue. Fresh mint cleans the palate and prepares it for the next sip. A long finish with honey and mint. 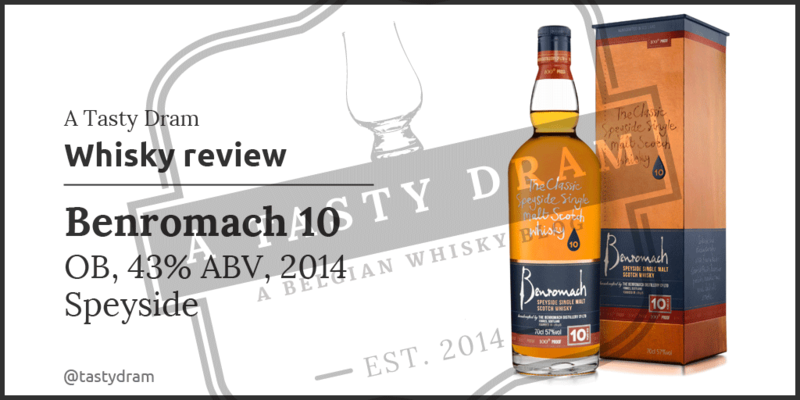 Three different Benromach 10yo. Tasting and comparing will be necessary. I'll just have to repeat my advice from last week. Not Glenfiddich or Glenlivet should be your go-to Speyside Whisky. It's this one. 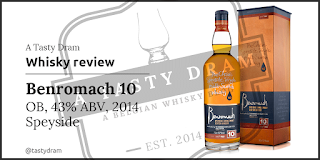 Benromach created a very fine entry level single malt (that surprises even whisky drinkers with more mileage) out of 80% bourbon barrels, 20% sherry hogsheads and a final twelve months in first fill Oloroso casks. It's a bit different from the 2013 version, but I like the extra smokiness so I'm not complaining.